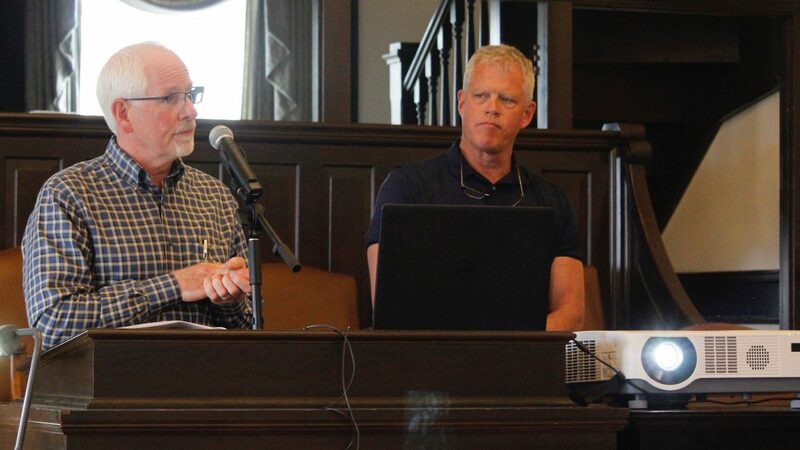 Paul Taylor, first responder assistance coordinator for the Douglas County Sheriff’s Office, listens to a question from county commissioners as Sheriff Ken McGovern, at right, stands by at the commission's Wednesday, April 10, 2019 meeting. First responders do and see a lot of things that most people don’t, and it impacts them, Paul Taylor told Douglas County commissioners at their Wednesday meeting. As a result, they need a different kind of help — and Taylor, first responder assistance coordinator for the Douglas County Sheriff’s Office, thinks he’s found a solution. His position is relatively new — created within the past couple of months, Taylor said — but he’s no stranger to the work. He told commissioners that he worked as a paramedic and paramedic supervisor for about 20 years; then he pastored for about 20 years, much of that time spent as a volunteer chaplain for local agencies. The solution Taylor and Sheriff Ken McGovern presented to the commission is a smartphone app created by the company Cordico. It’s a customizable app that offers first responders — and their spouses or significant others — 24/7 access to resources, right at their fingertips. “They’re a difficult group in that they’re proud, they are strong, they are well trained and they have a difficult time asking for help,” Taylor said, noting that first responders do well taking care of others but struggle to accept that they need care, too. “No one wants to be seen as inadequate or weak or not trustworthy, and so to that end, sometimes we have to be very intentional and proactive in order to get them the help that they need,” he said. A list of about 40 features and tools included in the app, all formulated specifically for first responders, target a range of needs. Some included are depression, emotional health, family support, financial fitness, injury prevention, mindfulness, making marriage work, nutrition, peer support, psychological first aid, supporting children who fear for your safety, trauma, a teletherapy portal and suicide prevention. According to a study Taylor cited in the presentation, about 46.8% of firefighters have considered suicide at some point in their career. 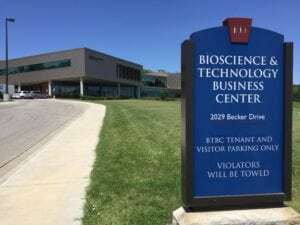 “This is a clear and present danger, and it’s something that if we can do something about it, it would be to our benefit as a community,” Taylor said. 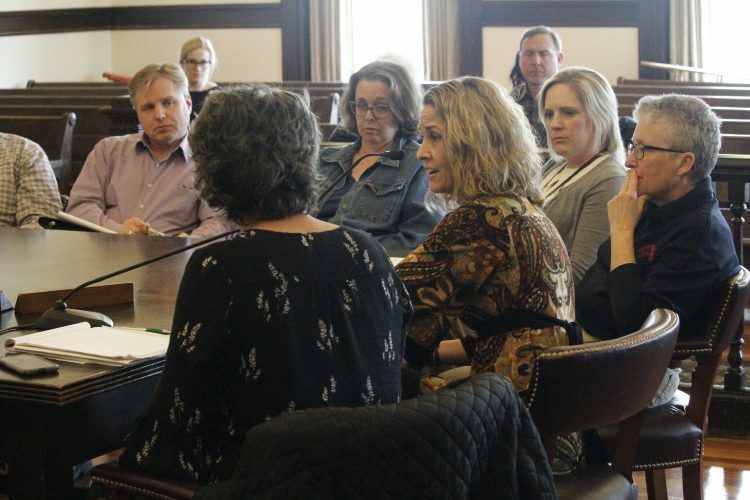 Taylor and McGovern told commissioners that the app could also connect first responders to local support groups and therapists, as well as to 24-hour national hotlines. It will also offer a map of local mental health practitioners and services. 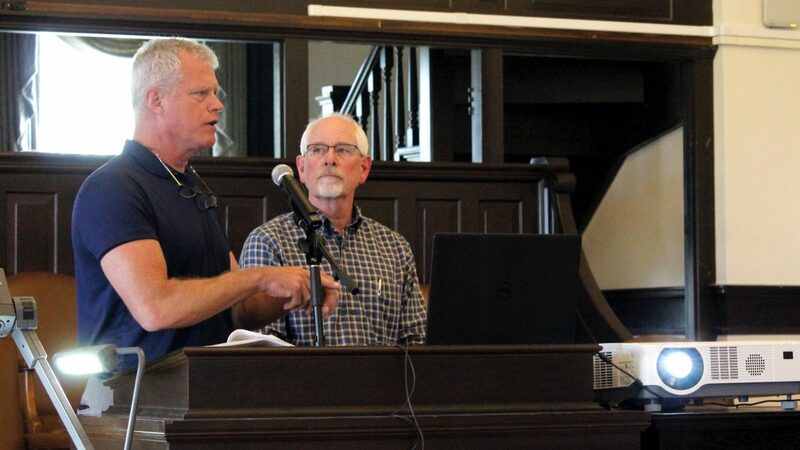 Douglas County Sheriff Ken McGovern, left, speaks to county commissioners at their meeting Wednesday, April 10, 2019. At right is Paul Taylor, first responder assistance coordinator for the Douglas County Sheriff’s Office. The app won’t be restricted just to sheriff’s office employees. It will be available to local police departments, Lawrence-Douglas County Fire Medical employees, dispatchers and more — all first responders in Douglas County, McGovern said. A contract for the program was not included in the commission’s agenda materials this week. McGovern said he was still in negotiations with Cordico. Interim County Administrator Sarah Plinsky said the program is within her authority to approve, but she would include the contract in next week’s meeting agenda, and she recommended including the program in the sheriff’s office budget in the upcoming budget cycle. Douglas County Commission Chair Michelle Derusseau thanks Sheriff Ken McGovern and Paul Taylor, first responder assistance coordinator for the Douglas County Sheriff’s Office, for their work in seeking a program to help area first responders and their families, during the commission’s meeting on Wednesday, April 10, 2019. Commissioner Patrick Kelly said he doesn’t know the culture of first responders, but he said he could understand wanting to be private about seeking help. • Plinsky presented the commission with information about some options for the county’s health insurance plans going forward. She sought some guidance from the commission as she plans to meet with department heads on Thursday and a group of county employees on Friday. 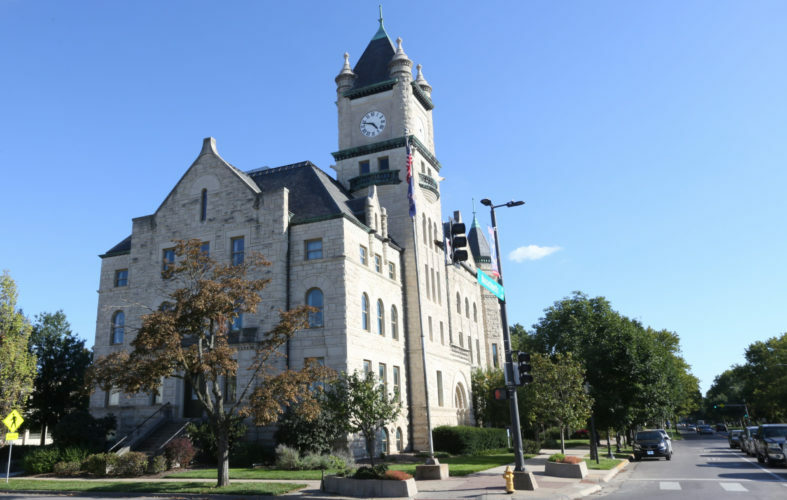 She told commissioners that the county’s low deductible plan — which has only faced modest cost increases for employees over the past several years — was going to have a significant impact on the budget. 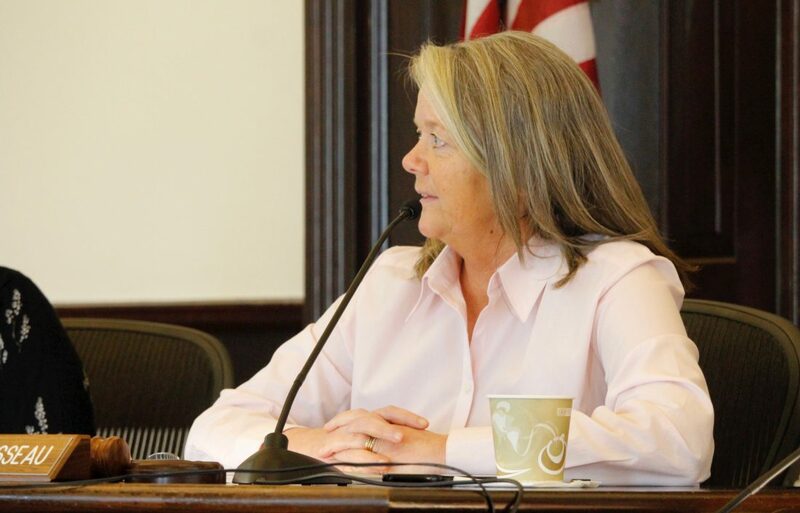 Derusseau said she was leaning toward an option that would increase deductibles from $300 to $500, and toward asking retirees to pay a bit more for their plans. Retirees currently pay 55% of their premiums. Plinsky has noted that most employers ask retirees to pay 100%. 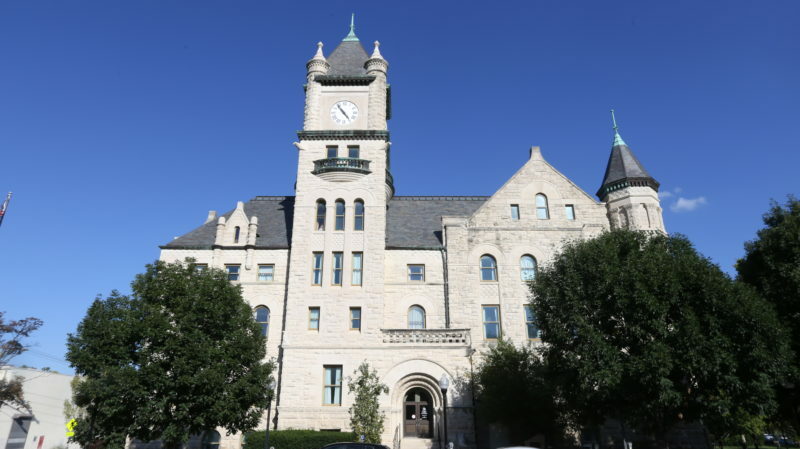 • Kelly mentioned that he attended a public forum with candidates for the Lawrence city manager position on Sunday, and he said he wanted to remind the public that the commissioners planned to keep Plinsky in her interim position until after budget season before beginning the search for a permanent county administrator. “I know we want to be as transparent and strive for as much engagement as possible from the public,” Kelly said. 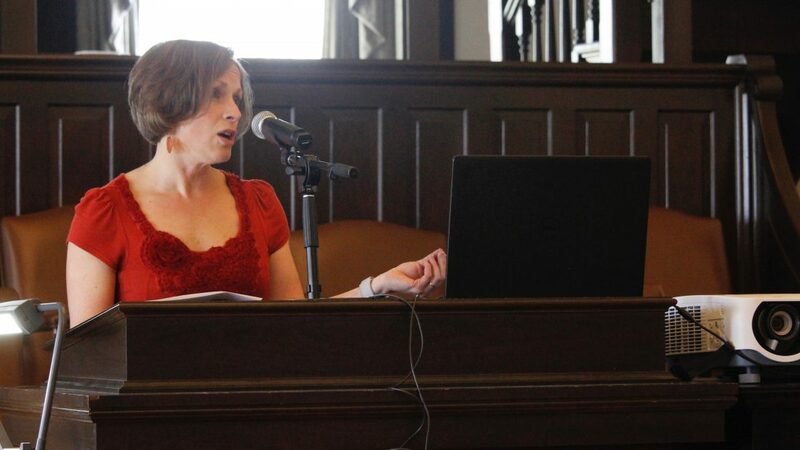 Jill Jolicoeur, assistant to the county administrator, speaks to Douglas County commissioners at their meeting Wednesday, April 10, 2019 about an agreement with the United Way of the Plains. 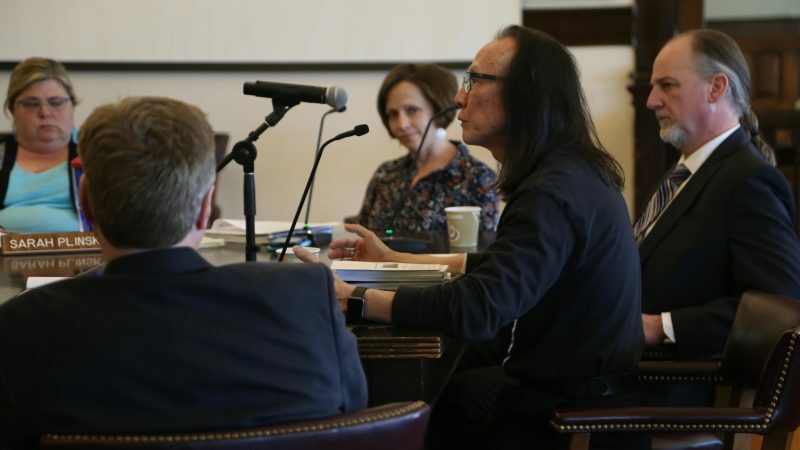 • The commission approved an agreement with the United Way of the Plains to make community resource data for Douglas County available to residents via a web platform called My Resource Connection. • Commissioners held a work session on township roads and budgets. An audio recording of that meeting is available via the county’s website, douglascountyks.org.